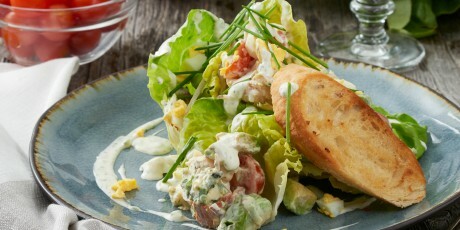 Mark McEwan's take on the Cobb Salad replaces chicken with cooked lobster. 1. Slowly cook the bacon in the oil, without allowing it to get excessively crisp. Set aside to drain on paper towels. 2. Spread garlic butter on the baguette slices and in a separate pan, fry them gently until golden. Set aside on paper towels. 3. Put 12 to 16 whole leaves of lettuce, the tomatoes, onion and radishes in a large bowl and toss with half the crème fraiche dressing. 4. Place the largest four leaves of lettuce concave side up at the centre of four chilled plates. Follow with a judicious scattering of the dressed tomato, onion, and radish, along with avocado, egg segments, bacon, blue cheese, and lobster. Repeat the layers with lettuce leaves of diminishing size until each salad is three or four layers tall. 5. Finish with an extra drizzle of dressing, the croutons, and the chives. 1. Whisk all ingredients together. Taste, and adjust seasonings.